The late Robert F. Kennedy used those words more than 40 years ago, but they still ring true today. 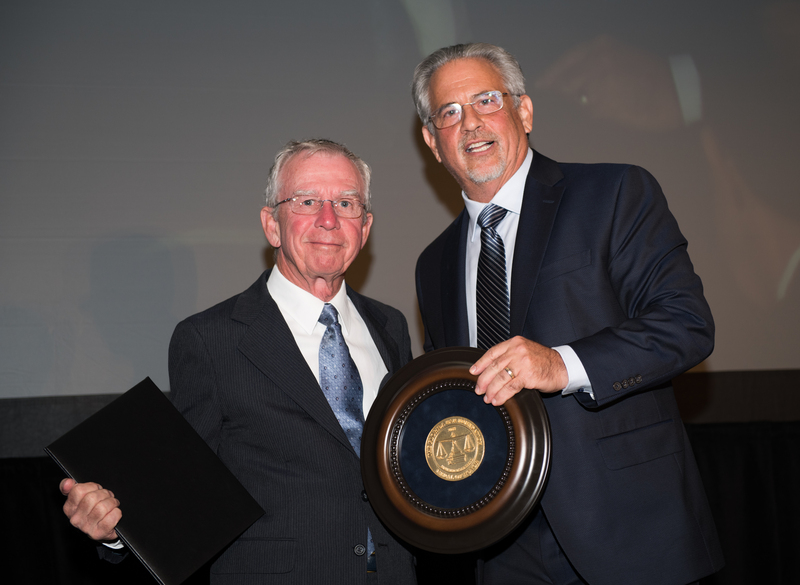 Howard Talenfeld, right, accepts the 2018 Medal of Honor for a Lawyer award from Florida Lawyers Mutual Insurance Company board member Dudley Goodlette. In Florida, we are fortunate to have a history of such greatness. Each year, we recognize worthy individuals with the Medal of Honor Award, the Foundation’s highest award for a member of the legal profession. The Medal of Honor may also be awarded to a member of the public or a lawyer not actively engaged in the practice of law who has made outstanding achievements in improving the administration of justice in Florida. The second is for a non-lawyer or person not actively engaged in the practice of law who has made an outstanding contribution to the improvement in the administration of justice through research, writing, or other deeds of such character and quality that, in the judgment of the Foundation, warrant the highest award that can be bestowed by the Foundation. Previous recipients have included W. Dexter Douglass in 2006, for a lifetime of selfless service, and especially for his service as chair of Florida’s Constitutional Revision Commission and to Janet R. McAliley, for her selfless dedication to better lives for children and immigrants, through her service to the Dade County School Board, and as president of the Florida Immigrant Advocacy Center. Recipients are honored each year at an annual dinner, where the Medal of Honor Award is generously sponsored by Florida Lawyers Mutual Insurance Company. The Steven M. Goldstein Award for Excellence was established by The Florida Bar Foundation board of directors in 1995 to honor the memory of Steven M. Goldstein. Goldstein, a former legal services attorney and professor of law at Florida State University College of Law, was a tireless advocate of the legal rights of the poor and disadvantaged and was respected nationally for his dedication to upholding the constitutional rights of those with unpopular causes. At the time of his death in 1994, at the age of 49, Goldstein was chair of the legal assistance for the poor grant committee and about to become secretary-treasurer of the Foundation. For many years, he served as the touchtone by which the Foundation measured the significance of its mission and its progress. This competitive award recognizes a project of significant impact work undertaken by a Legal Assistance for the Poor grantee. To be eligible, the project must affect a substantial number of poor persons, address an important poverty-law issue, involve a significant commitment of grantee program resources and staff, and reflect legal work which is of a high professional level. The Paul Doyle Children’s Advocacy Award honors Paul C. Doyle, Founding Director of the Foundation’s Legal Assistance for the Poor and Law Student Assistance Grant Programs (1991 to 2013) in recognition of his commitment to high-quality legal representation of Florida’s low-income children; for encouraging grantee programs to collaborate across geographic regions in order to bring the benefit of legal advocacy to low-income children regardless of their county of residence; for his strong and consistent support of Florida Bar Foundation Legal Assistance for the Poor and Law Student Assistance grantees; and for a career dedicated to promoting high-quality legal representation of the poor. The award recognizes and encourages systemic legal advocacy on behalf of low-income children by Florida Bar Foundation Legal Assistance for the Poor General Support and Children’s Legal Services Grantees. The Jane Elizabeth Curran Distinguished Service Award is named in honor of The Florida Bar Foundation’s first executive director, who, over her 32-year career, was responsible for implementing the nation’s first Interest on Trust Accounts (IOTA) program and spearheading virtually every innovation utilized in the IOTA/IOLTA movement throughout the United States until her retirement. The award is intended to recognize an individual who, over his or her career, has achieved meaningful, effective and lasting increases in access to civil justice for the poor in the State of Florida. The recipients may be legal aid attorneys, Foundation employees, non-lawyer legal aid staff members, or other public service/governmental staff whose work involves the justice system, and whose commitment sets them apart to an extraordinary degree as deserving of such recognition.